Since birth, we have been told that money makes the world go round. You simply have to have it to survive. You need it meet your every needs. Some people want to have a car or buy a new home, but really don’t know where the money goes. You no longer have to worry. There is a weekly budget planner template that you can use to see exactly where your money goes, and make adjustments to keep more in your savings account. Its ease of use is phenomenal with directions that are easy to follow. 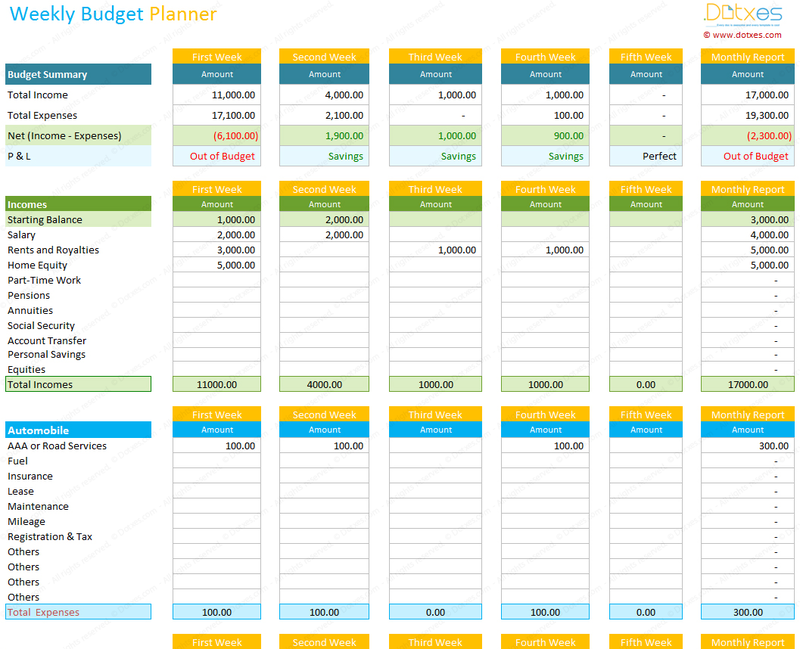 The budget spreadsheet is created with Microsoft Excel® 2007 and can be customized for use in any program higher. It covers everything that you would spend money on. You can easily condense the template for only the things that are important to you and you’re spending. Your magazine subscription is covered. So are your utilities and education costs. Your food and health care cost are also covered in the weekly budget template. The greatest tool of this budget planner template is that there is a monthly tab, so you can see your totals for the month. It makes it a lot easier to better gauge and plan for the months to follow. Life tends to throw little hurdles that you have to jump over. Your washer may need repair or you may want to purchase a new one. This template can easily show you how to go about budgeting and saving the money needed for your new washer. For those with a hectic work schedule, this would be ideal, since you don’t have to spend a lot of time inputting the numbers. You can fill in this sheet when you balance your checkbook. You can see exactly where your money goes. I liked the fact it is a weekly budget instead of a monthly. It was easily laid out so I can just plug my numbers in!